Heart, soul, environmentalism, parenting, joys of life. There has been fiery discussion in San Diego over the past two weeks regarding issues of increased transit and density to meet the needs of the growing urban community, and objections to density impacts by some members of the current population regarding potential changes to their neighborhoods. Some of the discussion, including among my friends, has clearly indicated that many engaged citizens want to see improvements in density (urban housing), transit oriented development, and forward-looking planning, and many have criticized the vocal residents in opposition to potential height limit increases for being shortsighted NIMBYs. While there are a number of areas within urban San Diego County that are already zoned for greater density – many in prime locations for redevelopment – there is a larger perspective that has been largely ignored in the recent conversation. The San Diego Association of Governments (SANDAG) serves as the region’s transportation planning agency. SANDAG is responsible to provide regional mobility for residents and comply with various state and local laws in its planning process. The Board is comprised primarily of elected leaders from around the County, and they occasionally provide leadership direction to staff. However, they primarily vote up or down (sometimes with proposed changes) projects and proposals prepared by SANDAG staff. The planning processes are lengthy and are, by design, data driven. Data like: who rides existing transit? Where do people live and commute? How will San Diego’s population grow in the upcoming years? What areas are primed for such alternatives as increased cycling infrastructure, and will people utilize the investments? SANDAG enjoys an expansive budget, and awards funding for regional projects, such as those promoting active transportation. They do not technically enjoy land use authority to drive transit oriented development (TOD), but can award or withhold funding from cities within the region who show or lack smart growth leadership. In the SB 375 greenhouse gas reductions framework, it is SANDAG’s responsibility to show leadership in this regard. SANDAG’s attitude about input from citizens. There is a great deal of discretion in the upper levels of staff leadership at SANDAG regarding allocations of staff resources. While there are multiple projects the massive agency promotes at a given time, some are quietly prioritized. The I-5 corridor is one such SANDAG priority. SANDAG is currently pushing the region toward expansion of the I-5 freeway, pairing it with some supportable coastal walk and bike trail and lagoon health improvements (though some of these lagoon deficiencies were actually caused by inadequate environmental mitigation of previous I-5 projects). Its partner in this effort is Caltrans, which has funded a Coastal Commission staff member for a little over five years. Many SANDAG projects require a public input process by law. Projects mysteriously prioritized at the upper echelons of SANDAG staff enjoy the greatest dedication of resources in the outreach process. Public outreach and education are done in the name of gathering feedback, but other than gathering the comments and formally replying to them, they do not substantively alter the predetermined goal: widen freeways. Last April, I attended one of their large public meetings on the PWP/TREP (Public Works Plan/Transportation and Resource Enhancement Program). I was appalled at the public resources on display at this overblown dog and pony show – my tax dollars lavishly spent on a sham of a public process. 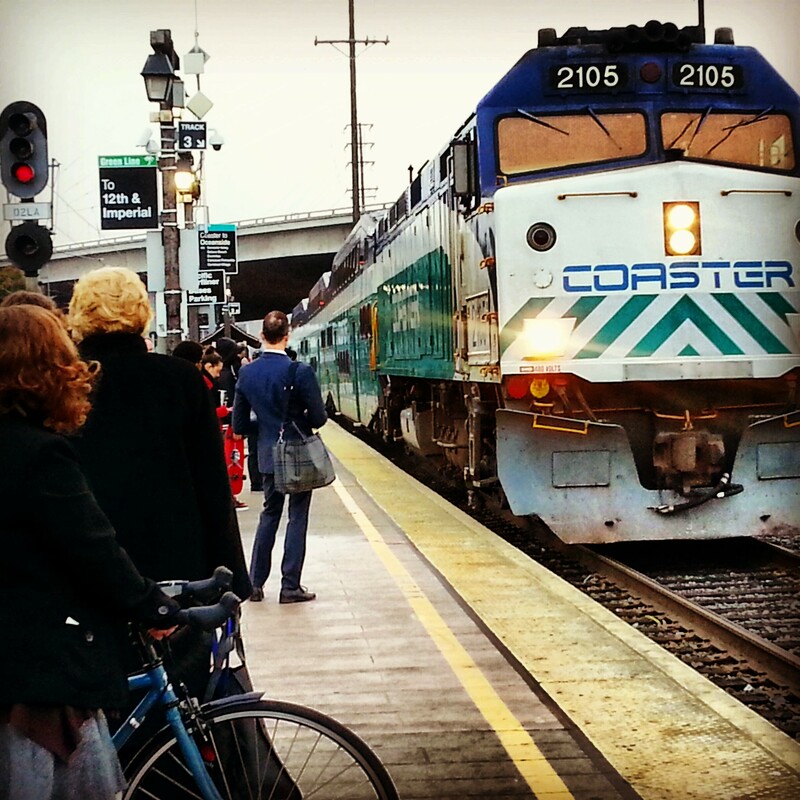 How much money has been spent to play up the most attractive portions of the North Coast Corridor plan and related elements – the most attractive portions, of course, representing the smallest SANDAG investment (widening the freeway costs the most)? SANDAG’s desired I-5 widening and related good PR projects also require amendments to the Local Coastal Plans (LCPs) of all coastal cities impacted by the project. As such, SANDAG staff has been faithfully making regular presentations at the Planning Commissions and City Councils of these cities, updating the LCP decision makers on the progress and details of various elements, though rarely discussing the foregone conclusion of widening the freeway during these information dumps. Rather than each city carrying the responsibility to develop its own LCP amendment and risk rejection by the California Coastal Commission, SANDAG and Caltrans are developing one LCP amendment for the North Coast Corridor. Staff essentially pitched it to the coastal cities as their only option to save resources, though in so doing these cities abdicate local control over project impacts to their residents. If you build it, they will come. But only if you build it right. The current version of the I-5 corridor plan and its elements commit the region to widening the freeway, but does not commit to a date-certain for double tracking the Coaster, let alone the modeling of a transit first alternative. Instead, the assumption is that based on their ridership data, only Low Income Minorities (LIMs) use alternative transportation. In a case of applied racism, LIMs’ lower-priority needs are assumed to be met by providing buses on the to-be-expanded freeway instead of efficiently expanded rail. Poor people aren’t entitled to go anywhere quickly, so efficient transit isn’t a SANDAG priority. Perhaps the Coaster will be double tracked sometime around 2035. As in the case of the double tracking of the Coaster, SANDAG’s long range plans contain some extremely supportable transit network expansion components. However, their implementation strategy is to almost exclusively widen highways FIRST, and push implementation of the rail components to some unnamed, noncommittal point in the future. They claim paid HOV lanes will fund rail expansion, refusing to consider that a commitment to a first phase complete transit system with reliable service in our urban areas would offload our existing highways and also provide an ongoing revenue source. They consider unconstrained scenarios and deem transit-first approaches to be the most desirable, then deem them infeasible. Returning to the recent example of unhappy Clairemont residents, the controversy is a prime example of the problem with piecemeal, line-by-line trolley expansions absent a commitment to integrated regional transit. SANDAG throws just enough money at siloed projects to set them up for failure: a self-fulfilling prophecy to prove their claim that “San Diego isn’t ready for transit” and justify more sprawl. 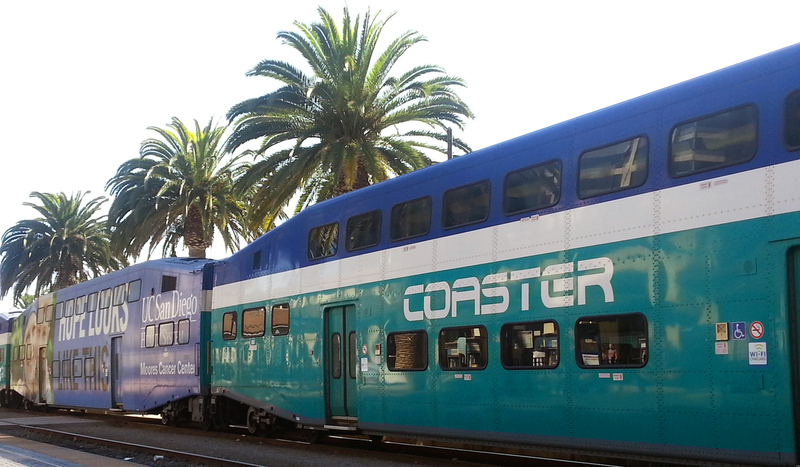 The North County Sprinter is one such example. Despite the availability of other rail cars used in the United States, they implemented cars only used in Europe, on incompatible old freight tracks. Then, they outsourced maintenance to slash costs. In retrospect, it was built to fail. I generally advocate for light rail expansion over freeways-dependant bus rapid transit (BRT) for a number of reasons. The trolley and Coaster are more pleasant to ride and are vastly more efficient than the bus, and would, if fully operational, attract more ridership. Buses are slower and are subject to the same stops and starts as traffic, which can frankly be nauseating and lend itself to scheduling abnormalities. They are generally more expensive to maintain over time than rail (the buses themselves and wear and tear on roads), and perpetuate fuel-based transportation and greenhouse gases. 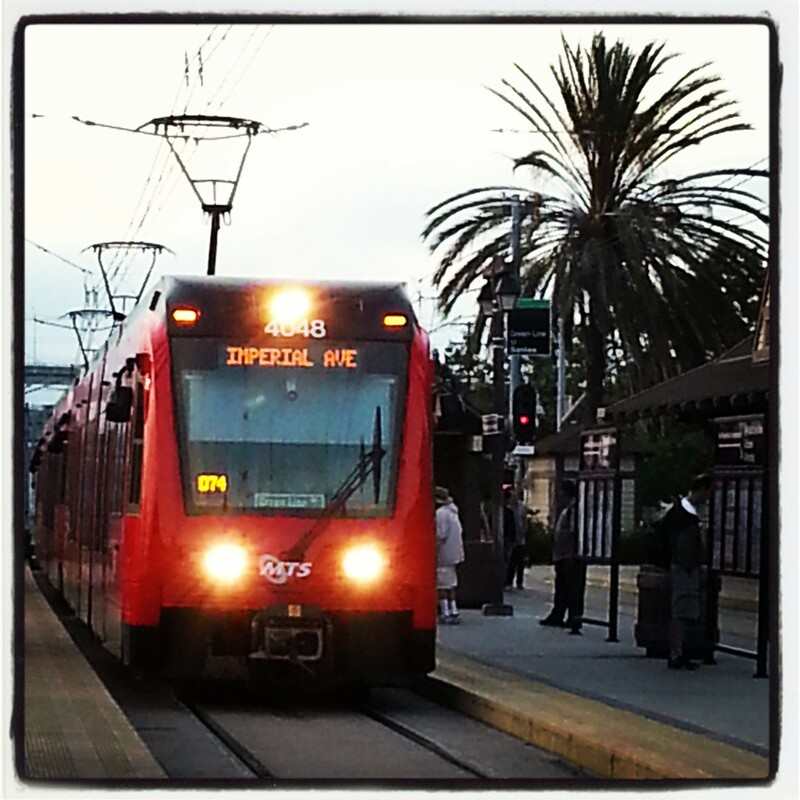 SANDAG promotes BRT over rail almost as a rule (remember the LIMs, referenced above?). However, SANDAG can’t even do BRT properly in San Diego. 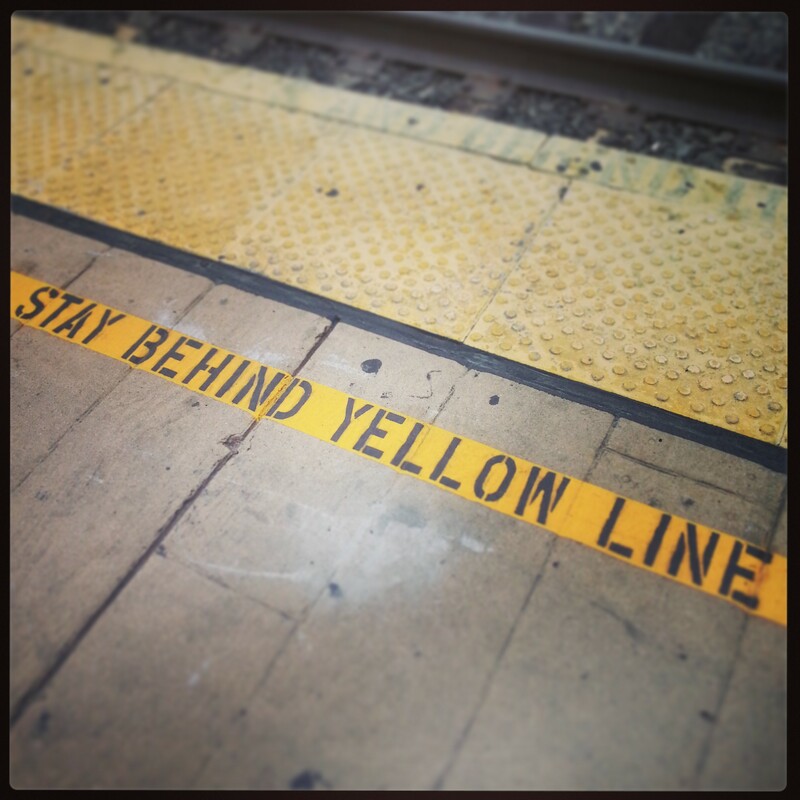 SANDAG treats “LIMs” – Low Income Minorities – like garbage. The current battle over height limits and the trolley expansion into UTC is another project SANDAG seems to be dooming to failure. Building a new line parallel to an existing line (coastal rail) that has not yet been built out is a wasted and obviously controversial investment. Instead, SANDAG should connect the Coast and Amtrak rail service via a tunnel from Sorrento Valley and Rose Canyon with a two-track single-platform station underneath University Town Center to serve commuters from the north (there are more of these) as well as the south. It would shorten the line, eliminate much of the grade for all trains (including freights), and would be more efficient, which would save operations costs in the future. Given its clear commitment to highways expansion prioritization, it seems SANDAG *wants* transit to fail in San Diego. More taxpayer-funded roads is the equivalent of sprawl development profits on the taxpayers’ dime. Road widening does not meaningfully reduce traffic congestion, and only temporarily benefits drivers. Following years of congestion-exacerbating construction, the traffic returns to its prior frustrating overcrowding within two to three years. Cue the renewed efforts of SANDAG to widen them yet again. While I support higher density and smart planning and realize that the interim stages can be frustrating and inconvenient, the case of the project proposal that so recently upset Clairemont and some UTC residents is a red herring. We need our leaders to lead intelligently, stop inhibiting urban progress (true smart growth), and stop wasting money on this faux approach to transportation planning. Considering the vast public relations and staff resources committed in recent years to widening the I-5, I wonder: What would a similar outreach program look like if the top-down decisionmaking was pro-transit (not a little line here and there, but a complete regional solution)? Who decides where and how those staff resources are allocated? There are certainly a growing number of engaged, bright citizens advocating for a dedication of our funds, managed by SANDAG, to be dedicated to rail and other transportation choices over highways expansion. I dream of a regional transportation agency that engages with the community planning groups, educates them to regional possibilities of comprehensive, functional transit to connect neighborhoods and city centers, takes back feedback for ideal routes and maximized opportunities for increased density, and brings the collaborative solution to fruition. That’s the opposite of what happens now, and it’s a travesty of taxpayer waste, backwards planning, increased pollution, decreased quality of life, and impoverished democracy. 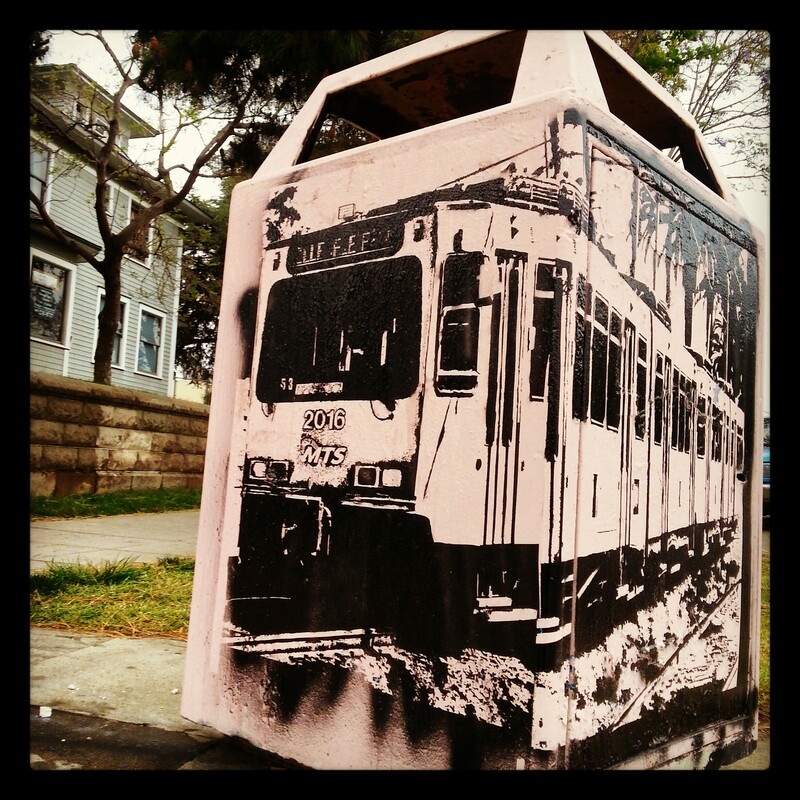 More light rail = preservation of San Diego’s beauty, and more of us out of our cars to enjoy it. The SANDAG board is made up of elected politicians who got into office with big contributions from the local real estate development industry. The leaders of that industry have bought up cheap ag lands in outlying areas like South Otay Mesa, Ramona, and Warner Springs. Those developers want to see taxpayer money used to extend and widen freeways leading from urban centers to their new sprawl housing subdivisions. So that is where SANDAG puts its priorities. If you don’t like what SANDAG is doing, find out which of your own elected officials currently sit on the SANDAG board and make a point of replacing them when they come up for reelection.